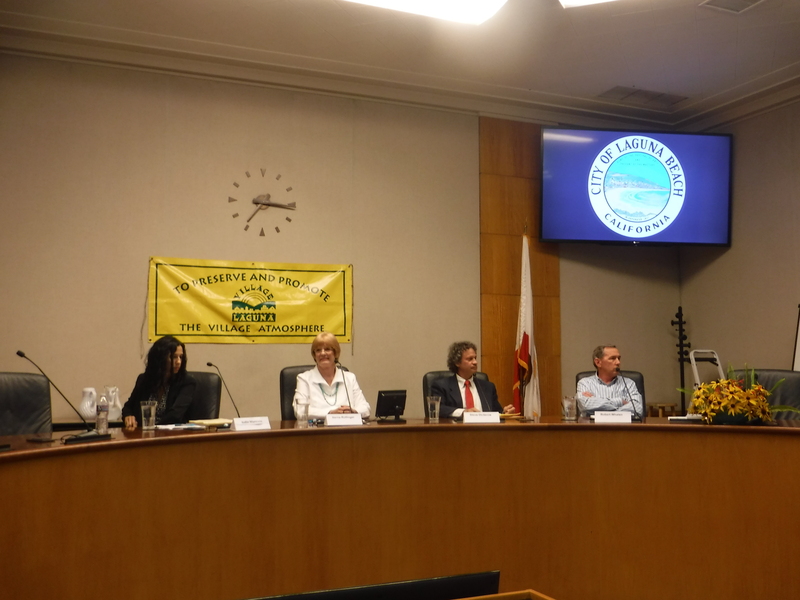 Sparks flew at the first City Council candidates’ debate when the subject of city employee pensions came up this past Monday, Aug. 26, at the Village Laguna forum in the council chambers. It was not a love match. City Council candidates debate hot topics, from left, challengers Judie Mancuso and Verna Rollinger, and incumbents Steve Dicterow and Bob Whalen. Photo by Charlotte Maserik. The conflict arose between newcomer candidate Judie Mancuso and incumbent candidate Mayor Steve Dicterow when candidates were asked to identify the city’s worst blunder. Dicterow jumped in. “Judie’s response indicates a total lack of understanding of how pension plans work,” he said, explaining that annual pay hikes are typically considered a liability and are amoritized over 30 years. Dicterow said the city is paying that liability down by $2 million a year, faster than legally required. “We will save over $20 million over the next 20 years by what we have instituted,” he said. The forum resulted in deliberate and sometimes dueling discourse from the candidates, who also included Verna Rollinger and Bob Whalen. Rollinger served as a one-term council member after serving 30 years as the elected city clerk. Whalen has served one four-year term and is seeking a second. Village Laguna president Johanna Felder said it was the best forum yet. “We got answers to the questions we asked,” said Felder, who mentioned earlier that getting straight answers at council meetings sometimes proved difficult. Dicterow jumped out of the gate with a bang, rapidly presenting his platform and answering questions submitted by Village Laguna members for each council candidate. Issues today won’t be issues in four years, he said, emphasizing that the city needs to develop a strategic plan rather than a tactical approach. Strategy is important, he said, because Orange County is still growing rapidly while Laguna wants to “stay the same size.” In a city that historically has offered plenty of year-round rentals, Dicterow said affordable housing is not an issue in Laguna; there’s plenty of affordable housing elsewhere in the county. “I don’t think people have a right necessarily to live in Laguna Beach,” he said. Plenty of strategy is already in place and paid for by the city, Mancuso countered, pointing to a copy of the city’s 2030 strategic plan developed in 2001. “This outlines exactly everything that is still wrong today,” she said, adding that in the interim multiple consultants have been paid high fees to identify the same problems. Residents’ needs over tourists’ needs come first, said Mancuso, who also supports affordable, long-term rentals. Candidates answered queries about a range of topics that included unsatisfactory consultants’ plans to revamp downtown and creating a village entrance near City Hall. Developing a village entrance has been volleyed around the city since the ‘70s. Rollinger and Mancuso agreed that no parking structure is needed, saying that Laguna already attracts enough tourists. Dicterow favors establishing outlying parking lots with trolley service into town. Whalen suggested creating alternatives in town, such as an underground lot beneath a park, a concept proposed for Las Brisas restaurant on Cliff Drive. With comments about too many tourists, short-term rentals, sober-living houses, traffic, peripheral parking and lack of affordable housing, “at least no one is suggesting a wall,” incumbent Whalen quipped. Each candidate also presented his or her particular strengths. First in line was Mancuso, an environmental and animal rights activist instrumental in winning passage of state animal-rights laws. She said her signature abilities are developing public policy and getting things done. Rollinger said her brawn comes from years of experience working for the city and tapping into the talents of residents to solve unique city problems. ”I know how to make City Hall benefit you,” she said. Dicterow said his strength is bolstering public safety services and local control. Whalen also pointed to public safety, mentioning his efforts toward removing nuclear waste at the decommissioned San Onofre Nuclear Generating Station and reducing the risk of fire and traffic accidents in Laguna Canyon by pushing for the undergrounding of utilities and removing poles. Moderator John Monahan asked candidates to pinpoint the city’s biggest mistakes. “Presumably it wasn’t something you voted for,” he quipped. Mancuso and Dicterow agreed that Laguna falls short as an environmental leader in failing to enact policies that promote use of sustainable resources and ensuring a healthy land and ocean eco-system. City treasurer candidates also faced off. Challenger Anne McGraw questioned the incumbent’s salary, investment strategies and expanded duties, which she said are more appropriate for the city’s finance department. “My work has contributed over $21 million to Laguna Beach funds by savvy investing,” said Laura Parisi, who has been the unchallenged elected city treasurer for 17 years. She said she has a proven track record of putting the taxpayers’ interest first. Lisette Chel, the uncontested incumbent candidate for city clerk, said she stands for public accessibility, keeping her office open and answering inquiries by email and phone expeditiously.